HONK!TX 2015 is Coming Up! There’s SO much music in Austin! Are you burnt out by all of the events you attended as SXSW comes to a close for 2015? Or did you avoid the madness at all costs because it just seemed too daunting with little people to keep tabs on? Hey, weren’t we JUST singing about teddy bear picnics?!? 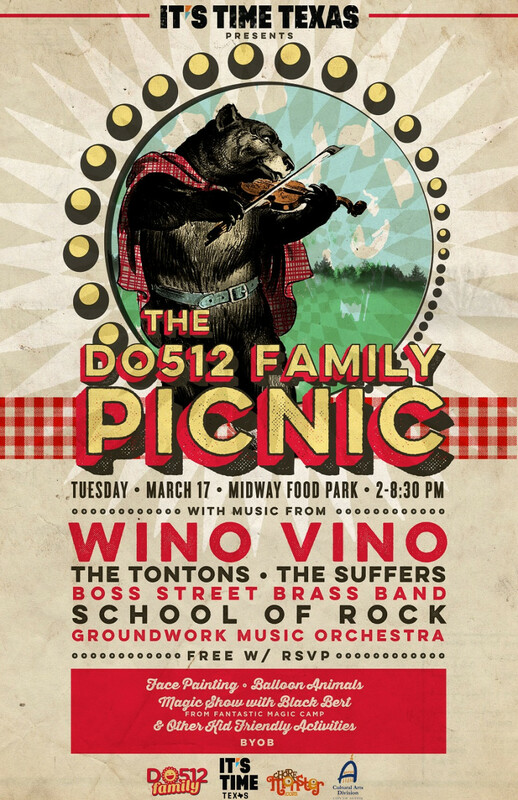 The first was Thursday’s free Do512 Family Picnic at Midway Food Park off of 360. I was a little stressed about the parking situation — there was a string of cars about a mile long parked on the highway’s steeply banked shoulder all the way down 360. (Would they ticket? Would they tow? Would my minivan tip over and roll into the ditch? Would I have to *live* on 360 until after rush hour ended?) But we got to see the Groundwork Music Orchestra, some ice cream, saw the world musicians The Flying Balalaika Brothers and their amazing gigantic triangular bass, and were wowed by the magic of Black Bert! We also checked out the Rock and Chalk event at the Domain — SUCH a cool new performance space! Ralph’s World, Elizabeth McQueen, KooKoo Kangaroo, and perennial Austin favorite Joe McDermott were there. All the kids in attendance decorated the sidewalks with chalk ALL the way around the stage, and well down the mall for an interactive party experience. The event was hosted by LiveMom.com, and Spare the Rock, Spoil the Child who will be hosting a weekly radio show on KUTX beginning in May. 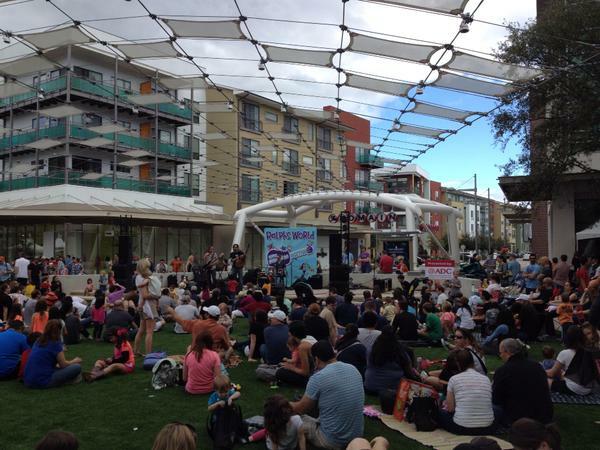 New performance lawn in the Domain, near the iPic! If you missed it entirely, keep reading — more opportunities to hear live music in family-friendly settings are right around the corner! The one I’m currently excited about is HONK!TX, happening next weekend! March 27th, 28th, & 29th! 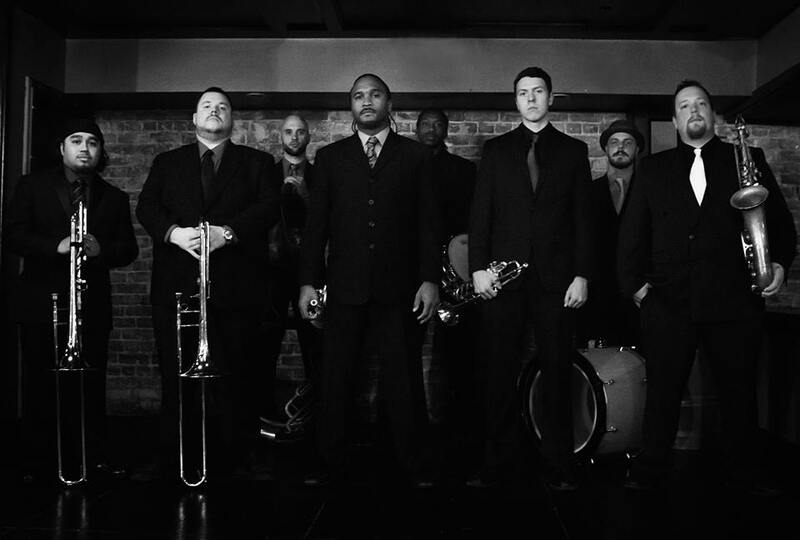 Boss Street Brass Band — high energy, original songs, and loads of talent. You do NOT want to miss them! HONK! 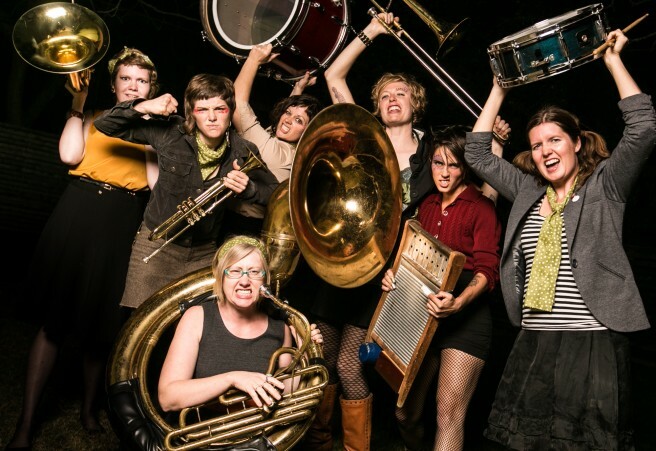 is a festival of community street bands who travel from all over the country to converge on a city for a weekend of free (OUTDOOR, no tickets required!) revelry. They’re taking over our parks, coffee shops, parading through the streets — and even making an appearance at the brand new Thinkery! We are proud to once again partner with Austin’s community organizations to provide free music to our underserved communities. This year’s community shows will take place at Frontsteps / ARCH, Boys & Girls Clubs of Austin, Rosedale School, the Thinkery, and the VSA (Program for Arts & Disabilities) Art in the Park Festival. Adams/Hemphill Parks Neighborhood, near 29th and Fruth St.
Once again we return to the Adams and Hemphill Parks where bands will be performing non-stop in performance spaces around the area. The vast majority of HONK!TX bands will be playing twice throughout the day. We’re kicking off our annual parade from Pan-American Park in East Austin at 12 noon sharp! 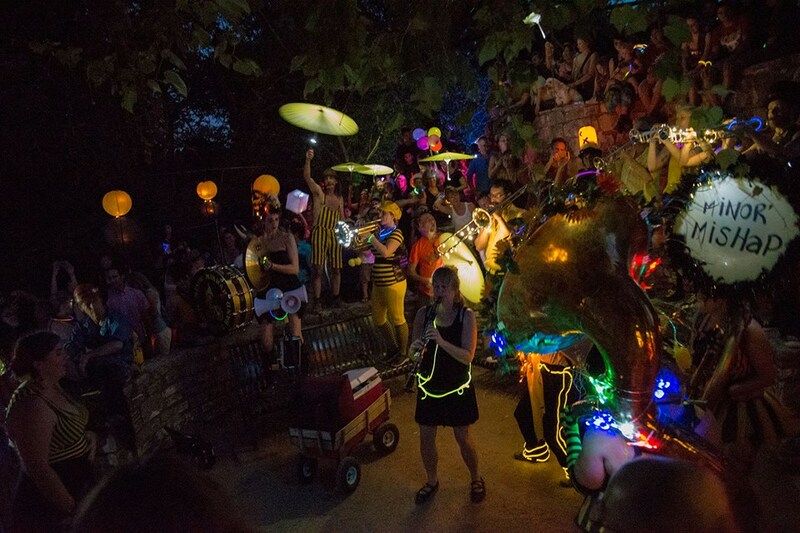 The route will see bands, community groups, and plenty of spectacle marching their musical way through East Austin and returning to Pan-Am Park for our annual all-band revue. The all-band blowout revue will give each band 8 minutes to strut their stuff while you shake your booty! I highly recommend Sunday’s parade. Plenty of parking around the perimeter, and a revue of all the bands in a single location at the finale — with a great play-scape on site! Bring a blanket and some snacks, and you’re good to go! 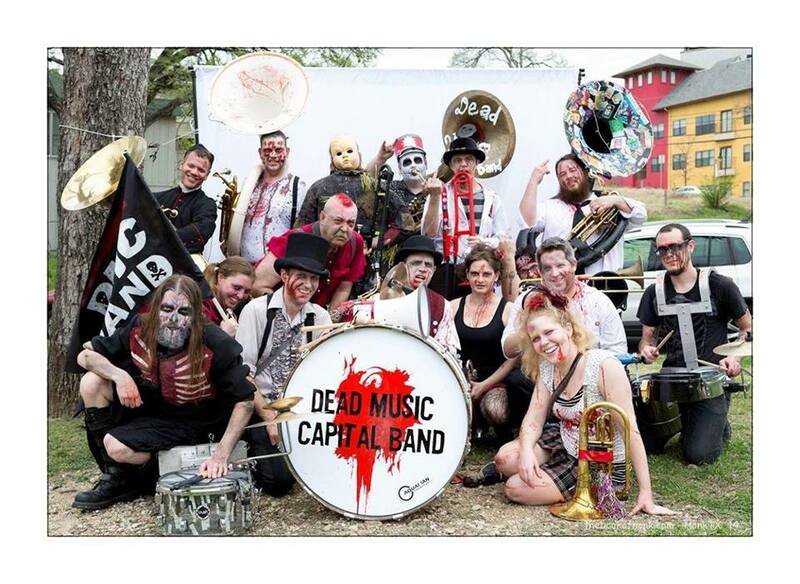 Dead Music Capital Band — a number of my friends and band-mates are in this group. I assure you they’re harmless, but proceed with caution because they might be a little scary for your littles. Or, as evidenced by MY family, your kid might decide after an impromptu march in their parade, to to BE a zombie. With a sharpie. Yes, he got nekkid. 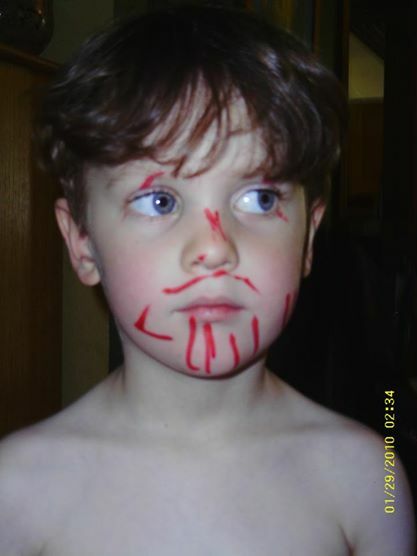 Yes, the sharpie was *everywhere. * Even there. REGISTER for classes at Northwest Rec Center! This entry was posted in Around Austin, Images, Links, Music Festivals and tagged 2015, austin texas, Black Bert the magician, Boss Street Brass Band, BSBB, Dead Music Capital Band, DMC Band, Do512 Family, Elizabeth McQueen, family-friendly, festival, Flying Balalaika Brothers, free music, Grounwork Music Orchestra, HONK!, HONK!TX, Joe McDermott, LiveMom.com, marching band, Minor Mishap Marching Band, music at the Domain, parade, Ralph's World, second-line, showcase, spare the rock spoil the child, Yes Ma'am Brass Band, Zombie Band. Bookmark the permalink.